This tutorial uses HTML and CSS. The CSS type is an internal style sheet. The styles for the id (identifiers) are defined in the head section using the style tag. The values for rounded_rectangle and rounded_circle set all for radii equally. The four radii are top-left, top-right, bottom-left and bottom-right. 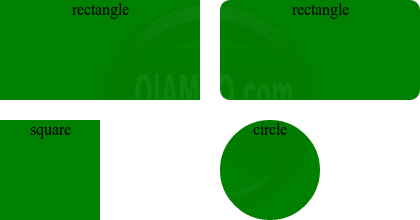 Compare original shapes to rounded shapes. The border-radius function can be used to round corners. The rounded corners can be applied to individual corners or all corners. One possible use by designers for border radii is to create shadows. The CSS border-radius property is turned off by default so that blocks are displayed as rectangles or squares. Border-radius is cross-browser compatible for modern browsers that support CSS3. Use the border-radius property for simple borders. If border radius are required, have a simple fall-back for incompatible browsers. Do not use proprietary formats such as the -moz-prefix. CSS Backgrounds and Borders Module Level 3. This entry was posted on Wednesday, February 29th, 2012 at 12:00 am	and is filed under Tips & Tricks. You can follow any responses to this entry through the RSS 2.0 feed. You can leave a response, or trackback from your own site.